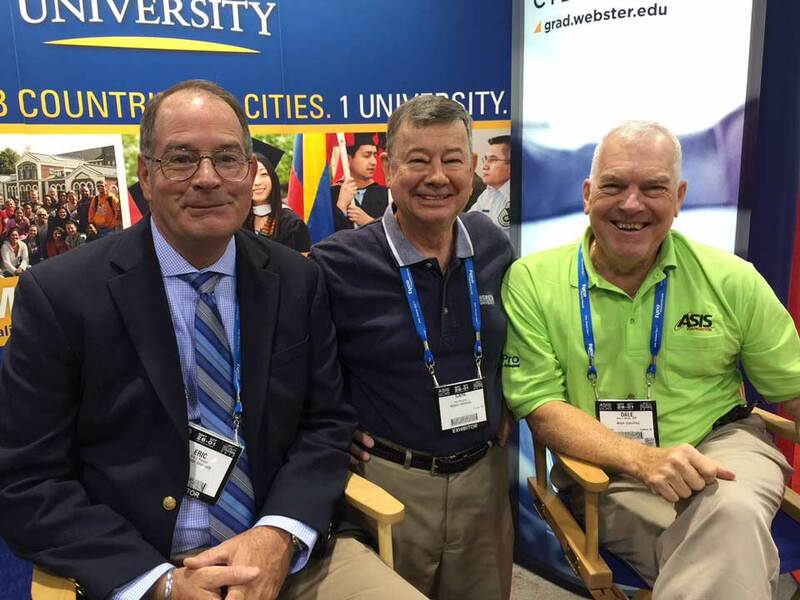 Eric Provost, Carl Richards and Dale Moyer at the Webster booth at the ASIS 61st Annual Seminar and Exhibits. Webster hosted a booth at the ASIS International 61st Annual Seminar and Exhibits Sept. 28-Oct. 1 in Anaheim, California. More than 600 exhibitors shared cutting-edge technologies, new products, and must-have services at the American Society for Industrial Security (ASIS) event. Each year 20,000 or more operational and cybersecurity professionals attend the annual meeting. Students in the MA in Business and Organizational Security, and the MS in Cybersecurity should consider membership. Webster University was represented by Thomas Johnson, interim dean, George Herbert Walker School of Business & Technology; Carl Richards, past director of Webster's National Capital Region; Dale Moyer, online adjunct professor, Business and Organizational Security Management; Eric Provost, adjunct professor, Orlando, Business and Organizational Security Management; and Michelle Loyet, manager, Student Services and Administration, Online Learning Center. The program prepares students to be well-versed to apply their knowledge and critical thinking related to domestic and international legal systems, private and public policies, and ethics. Skills in digital information protection, cyber terrorism, cyber fraud and theft, cyber intelligence and counterintelligence, digital forensics and pre-emptive and strategic force operation application situations are emphasized. In May 2015, Webster University announced the launch of its Cyberspace Research Institute.